As some of you may remember, four years ago I set out on an odyssey to play in international chess tournaments and seek a FIDE rating. At that time, I traveled to Budapest, Hungary to play in a section especially designed to give people an international rating. I achieved that goal and had such a good time touring Budapest that I decided to take more trips abroad to play chess. Based upon the reaction I get, I know this makes me odd even for a chess player. Non-chess playing people I know think that a European vacation is a grand adventure, although not one most can afford. But they fail to see the attraction of interrupting the day’s sightseeing by going indoors to play chess. Meanwhile chess players see the attraction of traveling to a chess tournament, but with a number of strong events in the US don’t see the need to travel to Europe to play in one. Need isn’t the operative word though, it’s that I want to vacation abroad and a chess tournament gives me an excuse for a particular destination. Besides, I think I would get quickly bored if all I did on a vacation was sightseeing. That brings me to the focal point of this narrative. This summer I set off to Switzerland to play in the Biel Chess Festival, held of course in Biel, Switzerland. I settled on this tournament for two main reasons. First, it had a grandmaster invitational along with an event I could enter. This way I could see some of the top players in the world in action while I played my games. Second, Switzerland seemed like a nice vacation destination. During my trip to Budapest, I jotted down some daily notes and took pictures with a cheap 35mm camera. Now armed with a laptop and a digital camera, I bring you the grand story of Bill in Biel. Biel is a small (well, not quite that small as I discovered) town in the northwest corner of Switzerland where the river Aare flows into Lake Biel. 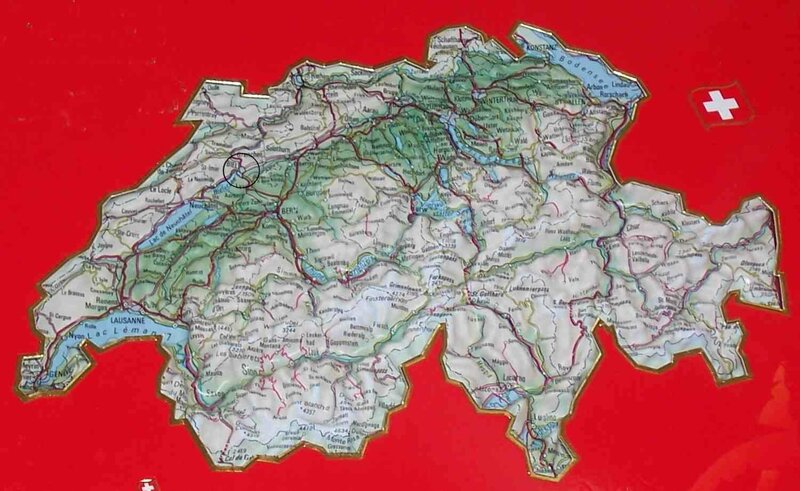 Zurich is around 120 miles due east while Geneva lies about the same distance toward the southwest. Bern, the capital of Switzerland, is 40 miles southeast. A regular train schedule can take you to any of these locations and others, typical of most of Europe. Biel is a manufacturing center, home to many of the well-known Swiss watch manufacturers. Anybody expecting a Rolex for Christmas can keep dreaming. At first, I was expecting Biel to be a small town like the one I grew up in, but it’s quite a bit larger than that. At this time, I don’t have a population figure but the closest approximation I can make is Mansfield. It’s set off from the bigger cities such that it’s not a suburb, but once you’re in town it’s a bit larger than you first thought. My itinerary called for flying into Zurich then taking a train into Biel. To use the previous example, this is analogous to someone from Zurich flying into Pittsburg and taking a bus into Mansfield. Each day in the links below gives a couple paragraphs on what I did that day along with some pictures. The games link will give you a self-extracting archive containing a ChessBase file with all my games. You can get the top player's games from TWIC or the Biel Chess Festival site.